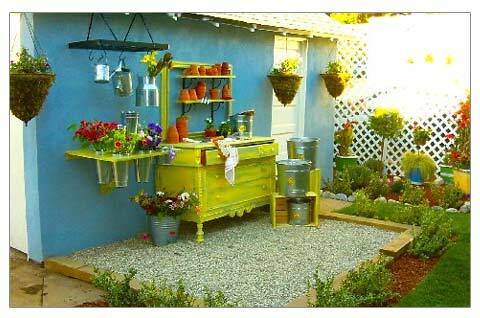 The potting area in this yard designed by Shirley Bovshow, evokes the feeling of a French flower market. I'm busy preparing for my presentation on "Art in the Garden" for Epcot's International Flower and Garden Festival next week, April 4-7. It's a big subject, but I'm narrowing it down to "functional garden art" because I like beautiful things that serve a purpose. Artistic garden furniture is a great way to infuse creativity and place your personal stamp in the garden. I designed a custom flower arranging table with holes for flower buckets and painted it to match the "antique" potting table. All the furniture was sealed with 3 coats of marine varnish. 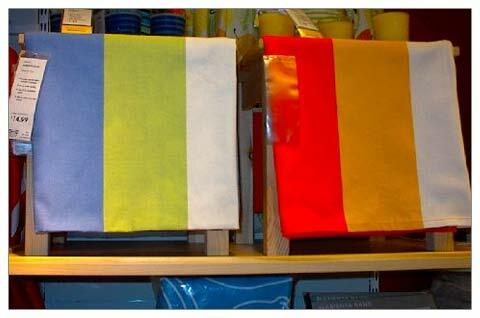 My inspiration for the "French flower market" garden came from these French linen striped towels. All the colors are represented in the yard. An old park bench becomes garden art when it has a favorite poem verse handwritten across the back. This one is in French! 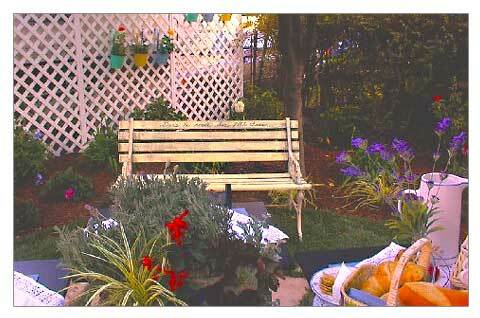 I painted the bench in yellow to tie in with the other garden furniture. If you like the look of this garden, please visit my website at ShirleyBovshow.com for more photos and a complete before and after chronicle of this yard makeover. I even include a plant list! Or, you can come and listen to me at the Epcot International Flower and Garden Festival in Orlando Florida! Here are some photos from the opening day at the festival. we always put garden furnitures made of hardwood in our backyard garden.`’. Thanks Anna. I love the art in small details- like the bench. Go make your own, can’t wait to see it! Shirley this is spectacular!!! I love functional art. The flowers can stay fresh while you arrange them right in the garden. My favorite thing was the bench. Just adding that saying on the top did it for me. The colors are perfect. You’ll be seeing this one day in my garden cause I’ve tucked it away for future study. Thanks for sharing and it really made my day. Hi Cinj. I agree. Gardens must afford resting places. Hope you are well! Beautiful. There’s nothing better than some good furniture in the yard. I like to have a quiet place to take a load off when I’m wandering through my garden.